Your most cost-effective move toward energy self-reliance! 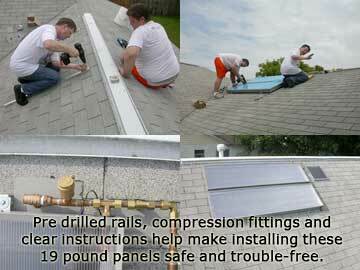 The light weight SolarRoofs 20-01 and 10-01 Solar Collectors are only one of the reasons why this powerful solar water heater is so easy to install. This high quality solar collector is a great value! 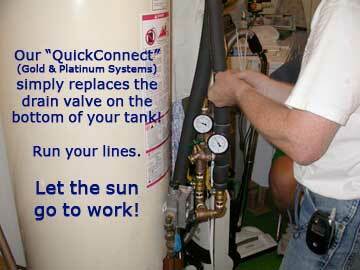 Combine it with the "Quick Connect" - a device that has the pump, connections & valves pre-assembled for fast, simple installation. Run your pipes, connect your controller and photovoltaic wiring, and you are ready to harvest the sun's energy! All parts are included in the Installation Kits. Making it easier to Harness the Sun! 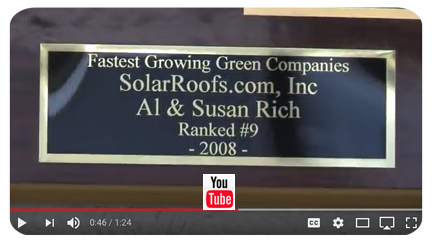 SolarRoofs.com installs Photovoltaic Systems in California. 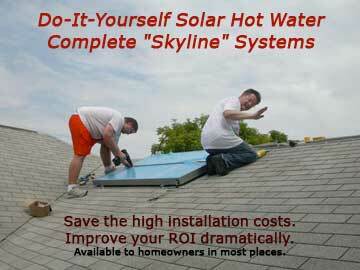 Our Do-It-Yourself Solar Hot Water Systems are shipped to you by UPS. Start your savings and lower your environmental impact in one day! Dealer and licensed installer inquiries welcomed. *These systems qualify the owner for a tax credit equal to 30% of the cost of the system. We manufacture solar systems for RVs, boats, Carribean (no frost) zones, and hard freeze zones. Please call for information.